Virginia Tech has hired Wofford’s Mike Young as the new head coach of the men’s basketball program, according to a release from the school on Sunday night. “Coach Young has earned tremendous respect and admiration across the nation for the integrity and winning tradition that were trademarks of his program at Wofford,” Whit Babcock said. “His track record of winning consistently on the basketball court combined with his ability to develop young men into leaders and help them fulfill their potential academically and athletically appealed to us at Virginia Tech. His propensity as a recruiter, a teacher and an innovative coach are all attributes that will serve him well at Tech. Young, a native of Radford, VA, has a career record of 299-244, with a 173-124 record in Southern Conference play. His 2018-19 team went 18-0 in conference play, 30-5 overall, and advanced to the second round of the NCAA Tournament after an opening round victory over Seton Hall. Young has been the head coach at Wofford since the 2002-03 season, and he has led the program to five NCAA Tournaments. Before taking the head coach position, he was an assistant coach at Wofford from 1989 through 2002. He also spent one year as an assistant at Radford in 1988-89. He played at Emory & Henry, and also spent two seasons on that coaching staff after his graduation from college. Under Young, Wofford has won two outright Southern Conference regular season championships and tied for a third. He was the 2019 Sporting News National Coach of the Year, and he’s been named the Southern Conference Coach of the Year on four occasions. Virginia Tech will hold a press conference introducing Young on Monday, April 8 at 11am. Fans are encouraged to attend. Click here for the full press release from Virginia Tech, which includes comments from head coaches and basketball experts from around the country on the hire. I certainly was hoping for a younger and/or more proven hire. I would have preferred a strong proven assistant from a P5 program if we could not entice a proven head coach. I am not sure what he did in the Southern Conference is the greatest track record. UVA made the ACC proud last night!! Okay so he’s not gonna cut corners. I get it. Integrity is a huge deal to him (and apparently Whit/Sands). Can’t help but think that if we tick to those guns and don’t get at least a little dirty we are going to end up being irrelevant in b-ball for the duration of Young’s tenure (and probably much much longer). He’s old, unproven at this level and not flashy. In my opinion VT needed to check at least one of those 3 boxes. This is (to me) a bad hire that will likely end up getting Whit fired in 2-3 years. 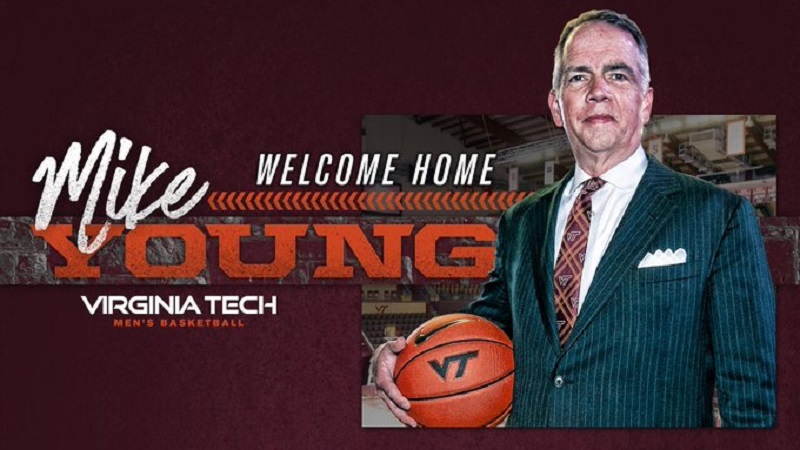 So…could Mike Young be the Frank Beamer of VT basketball? Give the man a chance yall. Frank was much younger than Young when he was hired but nice try. So, you’re saying much less experienced. Sure you can add that in, thanks. I’m wishing Coach Young the best. He’s got an empty locker room to fill and ACC competition to play. That’s a tall order for any coach, much less one who is unlikely to bring with him any players who could help. He may be a great hire, but it is likely 3-5 years before we will know and that is a long time to wait whether it happens or not. I waited a long time for VT basketball to be relevant nationally again. I am uncertain whether I will see it again, given my age. I trust Whit, but I’m starting to feel I should enjoy the individual national championships more, because the odds are getting longer I see one for a VT major revenue sport. That is not why I became a Hokie or why I’m proud to be one, but it is why I followed Hokie football and basketball avidly. I’m losing motivation, not because of this decision alone but the reality of the effect of money on collegiate sports that forces such decisions. The structure is stacked against even major schools that did not make the “storied program” stature before rules and money fossilized the infrastructure to protect those on top. It will take a major disruption for that to change, and that hits hardest on those schools that scrambled and jumped the growing chasm between elite programs and the rest. VT was unwelcome in the Big East and barely snuck into the ACC. A major push under Whit had us competitive and in the top half of the conference in quite a few sports, but the momentum is shifting ever so slightly as the rules favor the storied programs and VT’s footing is slipping just a bit. I hope Fuente and Young can overcome those obstacles, and it is certainly possible. But we cannot expect it, only root for them and enjoy it if the unlikely occurs. I will keep the positive feelings of watching this year’s team beat top tier ACC foes and thrash out of conference teams because they were expected to do it. They will go with early NIT memories, beating #1 Memphis State in the Cassell, following Ace Custis’ play, and beating Duke at their arena for the first time as an ACC opponent. Those will have to keep awhile now, unless realistic expectations are shattered. VT to me is mostly about a great education and the career and service that enabled. And athletic program success is mostly bragging rights about games so don’t get holier than thou if I look at this decision realistically. It does not tarnish the reputation of VT, just dims my hopes for this leisure activity as a sport spectator. I get where you’re coming from, but don’t Auburn and Texas Tech’s success this year prove there’s always a way if you get the right mix of players, coaches and luck? I think it’s always been the case for a team below the top echelon. It certainly was our football recipe in 1999 and our near success in basketball this year. Auburn (their coach specifically) are known cheaters. Not sure about TT but they have been above average in hoops for a while now. Not so much disappointed in him or his previous job, but maybe this would have been better if he were in his 40’s. When the 3-5 years as you suggest is up, then will the recruits be asking the same thing as Coach Beamer? Will you be here when I graduate? The Contract is fair for both sides. Can not believe I am complaining about age since I am older than Coach Young. To all you critics – I’m old enough to remember that in December, 1986 AD Dutch Baughman announced that we were hiring a FB Coach from low profile Murray St, a Tech alumnus with strong ties to Southwest Virginia. Many people were disappointed that we didn’t get a higher profile coach like Bobby Ross. Roanoke Times Sports Editor / Contrarian / Tech Disliker Bill Brill commented that many Tech fans were like a disappointed child at Christmas who got a sweater from grandma and not a shiny new toy. How did that hire in ’86 turn out? We all know that answer. My Lord let’s give Coach Young a heart felt welcome to Tech !!! How old was Beamer when he was hired? The money in athletics now compared to then makes the comparison completely ridiculous. Young ain’t no Beamer, dude. Even if he was the chips are stacked so far against him it will take a miracle (or cheating) to get anywhere close to where we were under Buzz. Didn’t Ross win a National Championship? Might have been a better hire than Beamer? We will never know. Welcome Coach Young [Irony in the name! ], but assessment of the hire is reasonable. And, as noted above, Beamer was much younger when he was hired. We probably would of gotten a P5 coach, if Buzz had not left a wasteland. He didn’t recurit the last 2 years. Maybe this guy will be more dedicated to the school. I know a lot of fans were disappointed with Buzz leaving, but be honest if you were a college coach and had the chance to move back to your home state and take over a power five school I think most of us would do the same. Better than leaving for another ACC job! Especially if a coach had done such a lousy job of prepping/recruiting for the future. He was fun while he lasted, but his ego would not allow him to try to rebuild that mess he left behind. He built one team and once it was finished he got out of Dodge. I think he did similarly at Marquette, but he stayed one year too long. Hopefully, Young will care more about VT than himself. I have no idea if Coach Young will have success at VT; however, I will trust that Whit did his homework beforehand and made the best possible hire given the circumstances. Would I have liked to see a proven winner from a P5 team who had gone deeply into the NCAA multiple times – certainly. Still, I don’t believe that disqualifies Coach Young from deserving an opportunity. P.S. I wonder how the Marquette fanbase responded when an assistant coach with only 1 year of head coaching experience (New Orleans) and a losing record (14-17) in that one season, was handed over the reins as head coach. Unlike most of those writing above, I am not an expert in the selection of coaches for a Power 5 college. I can only look at Whit’s choices in all sports thus far and assume he knows what he is doing and we do not. Go Hokies! Coming in as a replacement after the 5 Buzz years is about the hardest and worst-case scenario for any new coach, especially after low recruiting last year and the current decimation of the team. We all just need to accept that Buzz was really special, but that he is gone now, and we must move forward. This pick is about the most rational one to be made given our circumstances. I totally support Whit and President Sandman, 100%, in this transition. I believe this is the sentiment we Hokies must take. What Big-name hire could Whit possibly make behind Buzz accept steel Bruce Pearl or Gregg Marshall to Blacksburg? Obviously Alexander-Walker was going to make an unwise decision to declare and I think this will unfortunately trigger Blackshear so optimism would have been really low had Buzz returned next year. I say give Mike his shot and we ride. Its relax, lace up, and lets go. I am embarrassed by the comments here by so many of you. You should be ashamed of yourselves. I hope everyone of you who made disparaging comments thinks about how you cast a pall over this hire by acting like spoiled children. This man is a proven winner and a coach who gets the most out of his players. He’s a Virginian and this is likely a dream job he will never want to leave. I do trust Whit. He hasn’t made a bad move yet and you “experts” hiding behind a keyboard while making pronouncements on a decision that you have no insight into and no idea what went into that decision should shut up and let the man prove himself. Afterall, he’s just committed to the biggest job in his career and we owe him all the support we can give him until he proves us wrong. Grow up. 17 years at one place, but only 5 ncaa tournament appearances? that means he either struggled to win or didn’t win 12 of his 17 years in the southern conference—a 1 bid league! in sports, most hirings are based on potentia because nobody knows who’s going to work out or who who won’t. i’m not saying he won’t win at vt, but he wasn’t exactly killing it in the southern conference for most of his 17 seasons there either. Good post. I agree with your sentiment. So many people view the glass as half empty. Yup. Aside from being a fan–and as someone looking for a new job, I’m genuinely happy for him to move back home–where he wants–and continue to do what he loves. As anyone can tell you, a perfect job is hard to find–and no job is actually perfect, but I think this is a dream job for him, and that hunger can often carry people a long way. I agree with you Bon Air Hokie ! Sorry for your embarrassment. I am a local CPA with 30 years experience and lots of clients. There is no way I am prepared to work for one of the largest cpa firms. Most of us will give him a chance. Some of us, and you can ask will ,understand The Peter Principle. Welcome Coach Young – Most of the discussion is in bounds – discussion is good. Critical thinking with “critical” comments is fair. Maybe Young will be good, maybe he won’t. Engagement in the form of expressing an opinion is generally good. I guess it’s “In Whit We Trust” until he hires someone we don’t like. What a fickle group of fans. 2019 Sporting News “National Coach of the Year”. That would be better than all of the rest. If he can take a small institution like Wofford, and win 30 games with a team that he fostered into maturity, perhaps we are just undercutting his abilities as coach a bit. I am also believing he will be “VT” through and through committed, unlike Buzz, and will bleed Orange and Maroon. Make no mistake, the departure of Buzz did leave the cupboard empty, and it would take any coach a while to get back to stability. Welcome Coach Young! From anything I was seeing even going in to the NCAA tournmanent, and hearing the buzz (pun not originally intended) around Wofford, I would have been thinking their coach would have been on a short list that Whit Babcock might have been drafting up to talk to when/if Buzz departed at the end of the tournament. And that was before they gave Kentucky a major scare – and would likely have beaten them if their NCAA record-holding 3-point shooter had had even a slightly below average game instead of going 0 for 12. I guess part of the thinking is that, if he turns out to be good, he will finish his career with us. It’s a gamble but potentially a big payoff. Have to sign him to a decent size contract to show recruits we are committed to him. Unfortunately, he probably can’t bring any players with him that could help us. It’s not exciting for sure. Wonder if this was a first choice or if other targets didn’t work out. Best of luck MY! We are behind you. Just noticed his tie in the picture! Already ahead of Buzz in that department. We just hired a Hokie! I hadn’t thought of that possibility. Do you think it is photoshop or were you just joking? Some nice comments from other coaches on HokieSports. That gives me some optimism. From the comments here, on MBB, and subscriber’s board, plus other websites, I take it that 75% of the fan base is disappointed with Whit. I am surprised that Young will be making $2.4 million/year. I hope things work out for Mike Young. Honestly, I was expecting a better hire from Whit. Young is going to have to build an ACC coaching staff and recruit at an ACC level. Both will determine his fate as Tech’s basketball coach. I expect a few lean years in Blacksburg before Young makes Tech competitive. I know that many of you are smarter than Whit, but for God’s sake there is no reason to be so rude to the new coach. Funny, you don’t sound like a Hokie fan. Man, this is straight up Weaveresque in its lack of creativity …oh wait, Whit also blew a huge wad of cash so Weaver actually one-upped ole Whit… at least Weaver hired cheap. A lot of negative comments. Do we want Rick Pitino? I think not. Everyone’s mad that it’s not coach K. Lol. Give the guy a chance. We have had the best 3 years in the history of our men’s hoops and everyone thinks the new standard is elite 8 or fire the coach. Looking forward to progress coach Young. Go Hokies! Let’s give him a chance. Whit has proven to find good candidates. Sure not a known name but he checks off a list per Whit. (Cautious optimism here). And I get excitement is limited and it will never live up to Buzz but jeez the poor guy hasn’t even set foot on campus. Sorry to see this type of comment. So unfair! I assume Mike Young reads TSL. Me too, but he’ll be way too busy recruiting a staff and players to have time read any posts by knuckleheads on TSL. Thank goodness for that. Comments I have seen are embarrassing for all Hokies. Whit is paid to make these decisions, and he is darn good at it, and I hope the new coach realizes the whiners / complainers are, as in normal life, only a very loud and mostly uninformed minority!! Maybe they can find room on that uva bandwagon for you! I like the hire. I think he will do well and I like ethical coaches. Many of you just got spoiled with Buzz and bought into his brand, which buzz never intended to keep at Tech. He kinda screwed us over on the departure. At least he’s youn…at least he’s up and comi…at least he’s a good recrui…at least he’s cheap. Hell he’s not cheap… he gets 2.4 mill per year on a 5 year contract, if you can believe that. I think everyone needs to slow down on all the negative comments. Don’t you think that Whit Babcock had him on a list of potential candidates for sometime. Whit is a smart guy and knew that Buzz leaving was going to happen. Let’s give him a chance! He will be invested in Tech. Although I really liked Buzz, I never got the feeling that he was really vested in Tech. Mike Young will be! I am optimistic that Coach Young will be able to build in what Buzz has previously done. How do you think most other well-known coaches got their start! In Whit I trust! Sands comments day it all: SWVa, this is home; he:’s a man of integrity. Two things that probably rankled the administration and ADs office about the Williams tenure. Did not want a repeat, i.e. a mercenary, again. Seems these factors we’re critical in the decision making. And neither of which win basketball games. At 2.4 million he has a clear interest in money. Perhaps I’m not a soiled as some on this board, but for the love of god some of us need to get a life. Whit is paid to a job for our fine university and while some may not agree, we all need to offer our support if we want our future to be a success! Give the man a chance and don’t run him out the door before he has ever entered. I, like many, have patiently waited for our basketball program to become relevant on a consistent basis. None of us know what the future holds, but if we look to the future with tainted lenses, we may just miss something great! Welcome to Blacksburg Coach Young & Go Hokies! Whit is paid to do a GOOD job for our fine university and this is a risky and questionable hire and on top of that we made the guy a millionaire. Just not good by any standard. Are u Fing kidding me???? Seriously? We lose Buzz,UVA is about to win a national championship and all we can recruit is a damn JV coach? Wtf man. This is depressing. Sure he has a decent record last year but overall close to 0.500 in a terrible conference. Wow. Better be able to recruit or he’ll be out the door in 2 years. At least we still have football and that Foster LPD…..uhh oh wait. Grow up. He ‘s a local guy, proven experience, clean and has been in ACC territory for years. We are not Kentucky and should not want to be. This man will stabilize the program. Go to the Spring Game if you are “all football,” and don’t complain about the basketball program. Whit know what he is doing. Get off your high horse. This hire shows Whit most certainly does NOT know what he’s doing. Hell, if we wanted to go this route we could have gotten Wes Miller or even Ryan Odom. Guys that recruits can identify with and whose W/L records are much better than Young, who is barely above .500 in 17 years. And who cares if he’s a local guy, he’ll have to recruit outside of SWVA. Chill out and quit telling people what to attend and not to express their opinion if they disagree with how you feel. Maybe you should have applied. Looks like a repeat of the Jim Weaver era of VT basketball. No way should a state university, in the best basketball conference in the nation settle for a coach from nowhere. This hurts. Mr. Young, please prove me wrong. GO HOKIES!!! I don’t know the details, but I’m guessing Wofford was a fairly low seed in each case, which makes the four victories pretty impressive. If I’m not mistaken they only have 1 NCAA victory…this year. The their years show 1 game with a loss. I think the 2nd round is the round of 64 with the first four game panting round one. Aome He please correct me if 8m wrong. Sorry for mistypes. iPad not cooperating. I believe you are correct. I always thought calling the ” first 4 ” the first round would make it look like every team that lost in the round of 64 actually won a game before losing. The old everybody gets a trophy thingy. Glad they changed it. He was 1-5 in the NCAA’s, this was their first advancement to the 2nd round. “Fans are encouraged to attend.” Good luck with that. I heard it’s a 5 year, $12M contract ($2.4M per year). Please tell me that’s incorrect and someone left out a decimal point between the 1 and the 2. What in the actual hell? I am going to watch my aquariums for awhile. Now they all are in a “funk”….. I hope he can be a great coach for VT. We will soon know as there are a lot of good players in the transfer portal. How many will he get and how many current players he retains will soon tell. At 55, I hope he has the energy. He averaged 17.5 wins a year at Wofford. What will he do against the big boys? Now, five years later, we’re starting over, and again all the “dooms day” prognosticators have crawled out to spew their nasty uninformed “expert” analysis about decisions now being made as to how to move the program forward for success into the future. Mopes sit at the computer and complain about things they know not. I don’t mope. I’m not a mope. He is one of the best AD in the whole of college ranks. Maybe, some of you, those who must have instant gratification to be a fan, might want to find another band wagon and jump aboard.